SayWhatNews: Good morning Zack and Ben. Thanks for speaking with SayWhatNews. 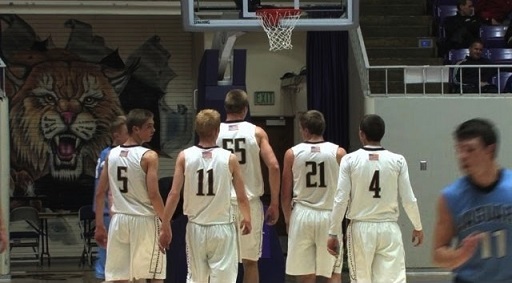 First tell us how you learned about the Lone Peak Knights Basketball Team from Utah? Zack: Last year on MLK day I went to Springfield, Mass. with my dad and my friend to the Hoophall Classic, which is an elite invitational for the top high school basketball teams in the country. I was interning for my dad’s company, Five-Star Basketball, and was covering the tournament, so I was fortunate enough to have a press pass for it. Anyways, as the teams came out for the second game, everyone was a little shocked. Archbishop Mitty from California was taking on Lone Peak High School from Utah and at first glance, the game looked very lopsided. Mitty had the current star of Arizona and highly touted recruit, Aaron Gordon, and other very tall players while Lone Peak was an all-Mormon team with no one over 6’5’’ with the exception of one 6’10’’ stud. As the game started, everyone in the gym was shocked. Lone Peak beat Archbishop Mitty by about 40 points and we had all witnessed it first hand. I knew that there had to be something about this team (Lone Peak) that made them this good. So I went to the press area by the locker rooms to talk to the Lone Peak players with my press pass and I was surprised yet again. I thought that everyone would already be talking to the Lone Peak players since they had just dominated, but instead everyone wanted to talk to Aaron Gordon who had a pretty good game with some exciting dunks. I took this as an opportunity to learn about Lone Peak, so I asked their 3 best players “How did this team come to be as dominate as you are?” and they all had the same answer. “We have been playing with each other since 2nd grade and have become best friends, so now we have a chemistry on and off the court that is unbreakable and helps us win.” They also added that 3 of them would be attending BYU together to play basketball after their Mormon missions. From this, I knew there was a story to be told. SayWhatNews: After Lone Peak beat the Archbishop team by 40 points, what made you want to go interview the unknown team (Lone Peak Knights) when the press usually wants the story from the well-known top team? Zack: During the game, I had my spectator hat on and while Aaron Gordon of Archbishop Mitty impressed me, I was even more impressed with Lone Peak winning by 40. Gordon’s dunks were cool and all of the reporters wanted to talk to him just because he was a top recruit, but I wanted to learn about the team that actually won by 40. No one in the gym was expecting what happened, so I wanted to know how it was possible that this small, unassuming team from Utah could do what they did. By speaking to the players, I was able to gain some insight, which eventually led to me making a documentary on them. SayWhatNews: Zack, at the time you were 14 years old and in the 8th grade. What inspired you to want to do your first film documentary about the Lone Peak Knights, a predominantly Mormon basketball team who went on to become the Nation’s #1 U.S. High School National Champs? Zack: Coming from the suburban town of Rye, NY (about 30 minutes outside of New York City), I was really able to relate to these kids. We share the love of basketball and both play for our schools and AAU. They played with each other since the second grade, and I’ve played with my best friend, Charlie, since the second grade as well. We had a lot in common, so for me, it was really cool to see kids just like me achieving their ultimate goal of winning a high school national championship. It really made me realize that anything is possible when one works hard. SayWhatNews: Before meeting the Knights, did you know anything about the Mormon religion and what did you learn? Zack: Before meeting the Knights, I honestly didn’t know much about Mormonism at all. I had heard of the popular Broadway play, The Book of Mormon, but that’s just about it. I knew going into making the project that I would learn a lot about Mormonism and I was really excited about that. When I met the team, I was amazed about some of the things I learned. You can’t really read online about Mormonism and totally understand it, but to hear Mormon’s talk about it makes it really special. 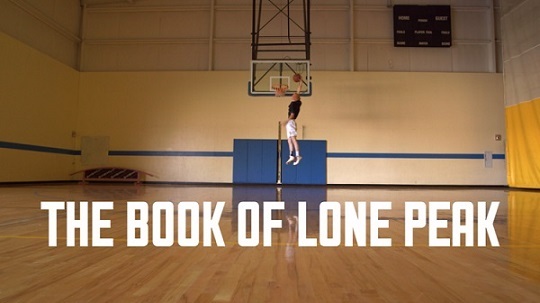 I learned that despite, their love and passion for basketball, religion and family come first. They value their religion so much that they are willing to take two years away from basketball while they are on top of the world to serve for their Church while on their missions. They all have really good values, which keeps them in check. To me, they are perfect humans (laughs). SayWhatNews: Zack, you mentioned most of the Lone Peak Knights basketball team had played basketball with each other since 2nd grade and are best friends off the court. During your time interviewing them, did the team reveal how they used their friendship and faith to help them become the best basketball team in the State of Utah’s history? Zack: Yeah, to me, I think this was a huge component as to why they were so good. By playing together since second grade, they knew each other’s habits and what not, so they played off of them. Nowadays, there aren’t many teams that can say that they played together since the beginning of elementary school given how much people switch teams now. It was really special and I think that without it, they may not have been national champions. I also think that their faith played a huge role in their success. They all behave very well and share a common religion that values the importance of helping others. In a team sport like basketball, in which playing with teammates and getting along with others is key and having this faith could be very helpful. A team this good doesn’t just come out of the blue, so things like having a strong friendship and having a common faith are a few of the many key components in their success. SayWhatNews: So Zack, do you think your age was beneficial to you in getting the Knights in-depth story because you were more relatable than an adult reporter would have been? Zack: Absolutely. I think that the kids spoke to me as if I were a friend, not some big-time reporter who is doing stories every day, and theirs is just one of them. I was really able to relate to the kids given that I am only a few years younger and I am pretty similar. In my opinion, this was a key component in the documentary coming out as well as it did. SayWhatNews: Do you still keep in contact with some of the guys? Zack: Yeah, I talk to them a decent amount actually. While Eric is doing great in his freshman year at BYU and TJ is dominating as a senior at Lone Peak, I have been able to text them a fair amount. I was able to see BYU play at Pepperdine during my Christmas break and meet up with Eric. It was great to see him. I am also actually going to Vegas this weekend to see BYU play a game in their conference tournament and I believe TJ will also be there supporting his older brother (Tyler, who is the current star of BYU). Nick is on his mission currently in Germany, but just last week, I was able to email with him for the first time since we filmed the documentary and it was really nice to catch up. SayWhatNews: Zack, now that you have your first film documentary under your belt, do you plan on making more films? Zack: I love making films and Ben has been a great partner, so I would love to make more with him. We have a few ideas in mind but one that we would love to do is a follow up to this story, a chapter two. We would love to visit the guys on their missions and get footage of their incredible experiences. We still need to get permission from the Church, but that would be awesome if we could. 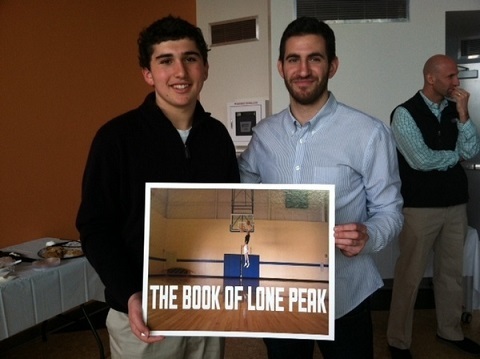 SayWhatNews: Ben, how did you and Zack (Samberg) start working together on the documentary – The Book of Lone Peak? Ben: Zack and I met through a family friend (Denise Levine) who had heard about the project Zack was pursuing, and luckily she threw my name into the ring as a filmmaker who might be able to help Zack produce the documentary. SayWhatNews: Ben, you are a New York based film maker. What inspired you to work with Zack Samberg, a 14 year old, 8th grade reporter who had never made a film? Ben: Originally, it was the content of the story that inspired me to get involved, but I quickly learned that Zack was smart and mature beyond his years and I was really excited to collaborate with him. SayWhatNews: How much time did your production team get to spend with the Lone Peak Knights? Ben: Overall I believe we spent about 8 days out in Utah speaking with the players and coaches. SayWhatNews: The basketball season was over, so where did you guys get the game footage from as well as the game footage where the guys were young? Ben: We were able to work with videographers from the area who had captured a lot of footage of the Knights season. 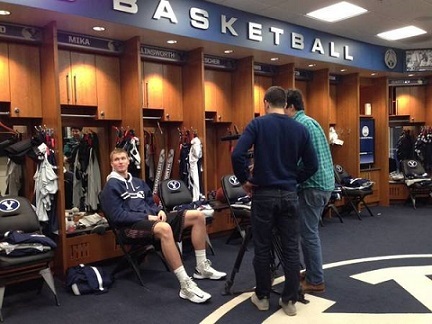 The footage of the players when they were young came from Mart Haws, TJ’s father. SayWhatNews: The documentary features music from Mike Posner and the group, Young Heel. How did these two artist music become part of The Book of Lone Peak? Ben: Mike Posner is Zack’s cousin, so we were able to contact him and his record label to get permission. I was really surprised to find out about the family link, but I was excited at the prospect of getting to use some of Mike’s music. JT Norton, the lead singer of Young Heel, and I have been friends since we were 10 or 11 years old and I thought his music would be a great fit for the film. SayWhatNews: As Zack mentioned earlier, some of the Lone Peak team have since graduated and some are seniors in High School. Have they seen the documentary yet? Ben: They have seen it and we’ve gotten really positive responses from all of the players, coaches and family members we’ve shown it to. SayWhatNews: Where can people see the film? SayWhatNews: Zack mentioned you two are planning on doing a part 2 to the documentary. Can you tell us a little more about the project and when we can expect it to be released? Ben: Zack and I are still putting the pieces together for Chapter Two. We hope to follow the players as they go on their two-year Mormon Missions and document their reunion at BYU as they try to repeat their high school success at the college level. A release date is pretty far off, but I’d guess late 2016 or early 2017. SayWhatNews: What’s next in the future for Zack Samberg? Zack: I’m actually not really sure. I love filmmaking but I also play high school basketball and lacrosse in addition to schoolwork. I’m only in 9th grade now (was in 8th while making the film) so I have some time to decide but I have a lot of options and am looking forward to the future. Film school is definitely an option but I want to enjoy high school while it lasts and see where life takes me! SayWhatNews: What’s next in the future for Ben Altarescu? Ben: My production company, Bows & Arrows (www.bowsxarrows.com) is in post-production on a documentary about Cockfighting in Mexico right now, which we shot last winter. It is scheduled to be completed in the Spring of 2014. We’re also developing a feature length screenplay, which we hope to shoot at the end of the year.